Jim Wofford was born on 9 April 1896 at Oklahoma. He married Pearl Beatrice Spence, daughter of Wilburn Leonard Spence and Mary Ellen Jarrell, on 9 January 1916. Jim Wofford died on 6 December 1968 at Oklahoma at age 72. [S250] U.S. Federal Census 1930 U.S. Federal Census, by Ancestry.com, Year: 1930; Census Place: Mosely, Delaware, Oklahoma; Roll: 1902; Page: 6B; Enumeration District: 0006; Image: 110.0; FHL microfilm: 2341636. Married Name 9 May 1947 As of 9 May 1947,her married name was Ramsey. Nelva Louise Wofford was born on 11 February 1930 at Oklahoma. She was the daughter of Jim Wofford and Pearl Beatrice Spence. Nelva Louise Wofford married William Marion Ramsey on 9 May 1947 at Oklahoma. Nelva Louise Wofford died on 17 August 2011 at Oklahoma at age 81. William Marion Ramsey was born on 3 December 1919 at Oklahoma. He married Nelva Louise Wofford, daughter of Jim Wofford and Pearl Beatrice Spence, on 9 May 1947 at Oklahoma. William Marion Ramsey died on 20 August 2011 at Oklahoma at age 91. Name Variation John Buckley was also known as Buckell. Name Variation John Buckley was also known as Buckle. John Buckley was born on 28 January 1768 at Virginia. He married Rebecca Huddleston, daughter of William Huddleston and Martha Myers, in 1796 at Bedford, Bedford, Virginia, also reported as 1789. John Buckley died in 1838 at Virginia also reported as 1860. Number of Household Members: 9. Total All Persons - White, Slaves, Colored, Other:8. Company: 57 Regiment Virgina Militia. Married Name 1796 As of 1796,her married name was Buckley. Married Name 1796 As of 1796,her married name was Buckell. Married Name 1796 As of 1796,her married name was Buckle. Rebecca Huddleston was born in 1775 at Bedford, Bedford, Virginia. She was the daughter of William Huddleston and Martha Myers. 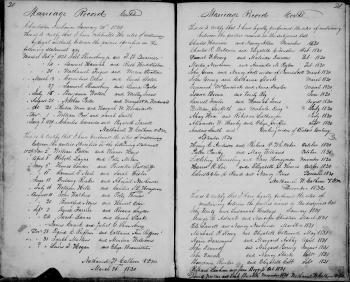 Rebecca Huddleston married John Buckley in 1796 at Bedford, Bedford, Virginia, also reported as 1789. Rebecca Huddleston died in 1810 at Kanawha, West Virginia. Name Variation Leah Buckley was also known as Buckle. Name Variation Leah Buckley was also known as Rebecca Leah. Married Name 1 November 1831 As of 1 November 1831,her married name was Nutter. Leah Buckley was born in 1810 at Monroe, Amherst, Virginia. She was the daughter of John Buckley and Rebecca Huddleston. Leah Buckley married David Nutter Jr. on 1 November 1831 at Kanawha, West Virginia. Leah Buckley died before 1880 at Fayette, West Virginia. Children of Leah Buckley and David Nutter Jr.
[S249] U.S. Federal Census 1850 U.S. Federal Census, by Ancestry.com, Year: 1850; Census Place: Western District, Nicholas, Virginia; Roll: M432_963; Page: 355B; Image: 273. 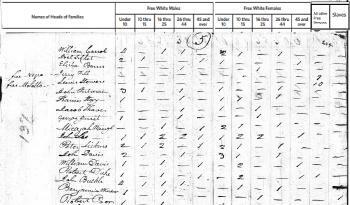 [S247] U.S. Federal Census 1870 U.S. Federal Census, by Ancestry.com, Year: 1870; Census Place: Falls of Kanawha, Fayette, West Virginia; Roll: M593_1686; Page: 112A; Family History Library Film: 553185. David Nutter Jr. was born circa 1807 at Monroe, Amherst, Virginia. He married Leah Buckley, daughter of John Buckley and Rebecca Huddleston, on 1 November 1831 at Kanawha, West Virginia. David Nutter Jr. died in 1880 at Leander, Fayette, West Virginia. Married Name 19 October 1893 As of 19 October 1893,her married name was Law. Effie R. Cline was born on 17 July 1874 at Indiana. She married William Asbury Law, son of Anderson Iverson Law and Mahala Rice, on 19 October 1893 at Jefferson, Indiana. Effie R. Cline died on 15 October 1969 at Indiana at age 95. Married Name 9 December 1931 As of 9 December 1931,her married name was Constable. Gladys Helen Law was born on 26 August 1911 at North Dakota. She was the daughter of William Asbury Law and Effie R. Cline. Gladys Helen Law married Rex Alvin Jacob Constable on 9 December 1931 at Indiana. Gladys Helen Law died on 1 March 2002 at Indiana at age 90. Rex Alvin Jacob Constable was born at Indiana. He married Gladys Helen Law, daughter of William Asbury Law and Effie R. Cline, on 9 December 1931 at Indiana. Rex Alvin Jacob Constable died on 19 April 1991 at Indiana. William Milliron was the son of John Milliron and Eliza Nolf. William Milliron married Emma Hannibal. Married Name Her married name was Milliron. Emma Hannibal married William Milliron, son of John Milliron and Eliza Nolf. Frank Milliron was the son of William Milliron and Emma Hannibal. Frank Milliron married Edna Wilbur. Edna Wilbur married Frank Milliron, son of William Milliron and Emma Hannibal. Dorothy Milliron was the daughter of Frank Milliron and Edna Wilbur. Dorothy Milliron married Clarence Ross. Clarence Ross married Dorothy Milliron, daughter of Frank Milliron and Edna Wilbur. Russell Jay Myers was born in 1894. He was the son of Joseph Beachly Myers and Ida Mae Kuhn. Russell Jay Myers died in 1976. Oma Myers was the daughter of Joseph Beachly Myers and Ida Mae Kuhn. Married Name Her married name was Bedale. Mary Myers was the daughter of Joseph Beachly Myers and Ida Mae Kuhn. Mary Myers married (?) Bedale. (?) Bedale married Mary Myers, daughter of Joseph Beachly Myers and Ida Mae Kuhn. Married Name circa 1896 As of circa 1896,her married name was Kleeber. Emily M. (?) was born circa 1872 at Wisconsin. She married Leonard Kleeber, son of Augustine Kleeber and Maria Hart, circa 1896. [S244] U.S. Federal Census 1910 U.S. Federal Census, by Ancestry.com, Year: 1910; Census Place: La Crosse Ward 4, La Crosse, Wisconsin; Roll: T624_1716; Page: 11A; Enumeration District: 0100; FHL microfilm: 1375729. Charlotte E. Kleeber was born circa 1898 at Wisconsin. She was the daughter of Leonard Kleeber and Emily M. (?). Donald L. Kleeber was born circa 1904 at Wisconsin. He was the son of Leonard Kleeber and Emily M. (?). Herman Pieper married Laura Meyer. Married Name Her married name was Pieper. Laura Meyer married Herman Pieper. Clifford W. Pieper was born on 28 February 1925 at Sauk, Wisconsin. He was the son of Herman Pieper and Laura Meyer. Clifford W. Pieper died on 18 January 2010 at age 84 Clifford W. Pieper, age 84, of Sauk City, passed on Jan. 18, 2010, after an extended illness. He was born on Feb. 28, 1925, in the Troy Township, the son of the late Herman and Laura (Meyer) Pieper. After graduating from Prairie du Sac High School Cliff farmed and was employed by Badger Ordinance Works near Baraboo. In 1954, Cliff entered the insurance business (Farmers Mutual - later becoming American Family) retiring as an agent in 1995. Cliff's work ethic was "Work hard - play hard and always with honesty and integrity". He had a spirited sense of humor and loved people. Cliff was a member of First United Church of Christ of Sauk City, serving and contributing in many ways. He had a love of the land and enjoyed his acreage of woodland appreciating nature at its best. He is survived by his wife, Lois of Sauk City; son, Todd (Cindy) and special grandson, Tim of Prairie du Sac; daughter, Susan of Madison; brother, Russell (Sherry) of Sauk City; sister, Eunice (Wayne) Peterson of Madison; and sister in-law, Delores Pieper of Sauk City, numerous nieces and nephews, and many friends. In addition to his parents he was preceded in death by brothers, Calvin, Dean, Dwayne, Merlyn (Gertrude); sisters, Luella (Ray) Jensen, Leona (Art) Denzer, and Darlene (Wayne) Manthe. Cliff leaves with us the legacy of a very generous man, who helped people whenever or however he could. In lieu of flowers, memorials if wished, will be established by the family. "The strife is over - the battle is done", Alleluia! A funeral service will be held on Thursday, Jan. 21, 2010, at 11:30 a.m. at FIRST UNITED CHURCH OF CHRIST in Sauk City, with Pastor Bill Kapp officiating. Friends may call from 9 a.m. until time of service. Burial will be held at the Sauk City Cemetery. Married Name 25 September 1948 As of 25 September 1948,her married name was Denzer. Myrna Mae Adam was born on 28 December 1924. She married Delbert O. Denzer, son of Herbert Benjamin Denzer and Minnie M. Gasser, on 25 September 1948. Myrna Mae Adam died on 24 July 2010 at age 85 Myrna M. Denzer, age 85, of Beaver Dam, died peacefully on Saturday, July 24, 2010 at Prairie Ridge Assisted Living in Beaver Dam. Myrna Mae Denzer was born on December 28, 1924 in the town of Beaver Dam to Gottfried and Ethel (nee Davis) Adam. She graduated from Beaver Dam High School in 1942. On September 25, 1948 Myrna was united in marriage to her lifetime companion, Delbert O. Denzer, at First Ev. Lutheran Church in Beaver Dam. Myrna enjoyed spending time with her family, extended family and neighbors. She loved gardening, canning and fishing. Myrna was a lifelong member of First Ev. Lutheran Church, where she was actively involved in many areas including, Sunday School, choir, retirees, quilting, WELCA and Thrivent for Lutherans. Myrna is survived by her husband, Delbert of Beaver Dam; her son, Duane D. (fiance Ronda) Denzer of St. Cloud, FL; her daughter, Sandra M. (Joe) Mitchell of Las Vegas, NV; two granddaughters, Tiffany M. (Tony) Calleja of Henderson, NV and Heidi R. (Walt Vodrazka) Albrecht of Las Vegas, NV; one grandson, Matt T. (Bethany) Denzer of West Palm Beach, FL; one step-granddaughter, Michelle Mitchell of San Diego, CA; one step-great-grandson, William Mitchell of San Diego, CA; and one sister, Madelyn M. (Roland) Beske of Beaver Dam. She is further survived by nieces, nephews, other relatives and friends. Myrna was preceded in death by her parents, her in-laws, her grandparents, her infant brother, a nephew, five brother-in-laws and four sister-in-laws. A funeral service for Myrna will be held on Thursday, July 29, 2010 at 11:00 a.m. at First Ev. Lutheran Church, 311 W. Mackie Street in Beaver Dam, with Rev. Dr. Mark Molldrem officiating. Visitation will take place on Wednesday, July 28, 2010 from 4:00 until 6:00 p.m. at Cornerstone Funeral & Cremation Services, 135 Keller Blvd. in Beaver Dam, and also on Thursday from 10:00 a.m. until the time of service at the church. Burial will take place at Highland Memory Gardens in the town of Trenton. Memorials may be directed to First Ev. Lutheran Church. Cornerstone Funeral & Cremation Services in Beaver Dam is honored to be serving the family. Henry Born married Matilda Kopf. Henry Born was born circa 1884 at Wisconsin. Married Name Her married name was Born. Matilda Kopf married Henry Born. Matilda Kopf was born circa 1889 at Wisconsin. Clifford John Wilzewski was born on 2 November 1913 at Wisconsin. He was the son of Edwin Frederick Wilzewski and Myrtle C. Seils. Clifford John Wilzewski married Viola C. Born, daughter of Henry Born and Matilda Kopf, after 1940 at 3rd marriage for her. Clifford John Wilzewski died on 16 August 1989 at Wisconsin at age 75.